With a generous donation of $150,000, Emera New Brunswick is increasing its investment in graduates of Hazen White-St. Francis School who are attending the University of New Brunswick. 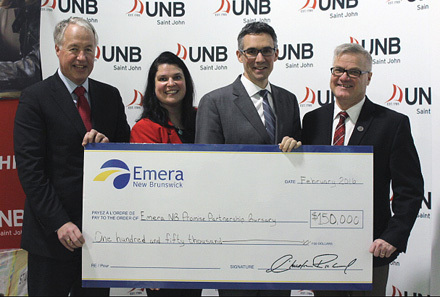 The gift will further enhance the Emera New Brunswick Promise Partnership Bursary, which is awarded on the basis of financial need to UNB students enrolled in an undergraduate degree program on a full-time basis. The recipients must have attended the Hazen White-St. Francis School and participated in the UNB Saint John Promise Partnership program. The new commitment follows an initial donation of $66,000 the company made in 2012-13 to the bursary program. “At Emera, we believe in giving back to the communities where we live and work. With that in mind, we’re very pleased to be supporting the Emera New Brunswick Promise Partnership Bursary. We believe this bursary has the potential to change the lives of students and families. We’re proud to be supporting such a meaningful initiative,” said Emera New Brunswick General Manager Christian Richard. The Promise Partnership is a community-based and university-run academic enrichment and poverty reduction initiative focused primarily on the priority neighbourhood of Crescent Valley. Its mission is to support academic achievement and to make post-secondary education a possibility for students from neighbourhoods that have traditionally experienced low high school graduation rates. It accomplishes this by offering five main programs that are specifically designed and aimed at students from grades K-12. Through the Promise Partnership’s student mentoring program, the program provides UNB Saint John students with opportunities to think critically and creatively outside the classroom. In turn, the program promotes innovative thinking through exposure to different socio-economic systems and assists in building a better province through leadership in community engagement. “The UNB Promise Partnership is a much-loved program of the students at Hazen-White St. Francis School,” said Megan Donovan, Hazen White-St. Francis School principal. “Our students admire their mentors, and it is through these relationships that the spark of lifelong learning is ignited." Kendra Eatman, a second-year nursing student from Saint John was the inaugural recipient in of the Emera New Brunswick Promise Partnership Bursary in 2014. Alexa Parks, a first-year arts student from Saint John, was the second recipient in 2015.